A waterfront of luxury mega-towers is one potential future for Two Bridges but as artists and creative workers, it is our job to imagine and work alongside our neighbors to make real other possibilities. As Senegalese scholar Felwine Sarr recently said, “the symbolic space is a tectonic space where things can shift. When something shifts there, somewhere else, something moves also…. 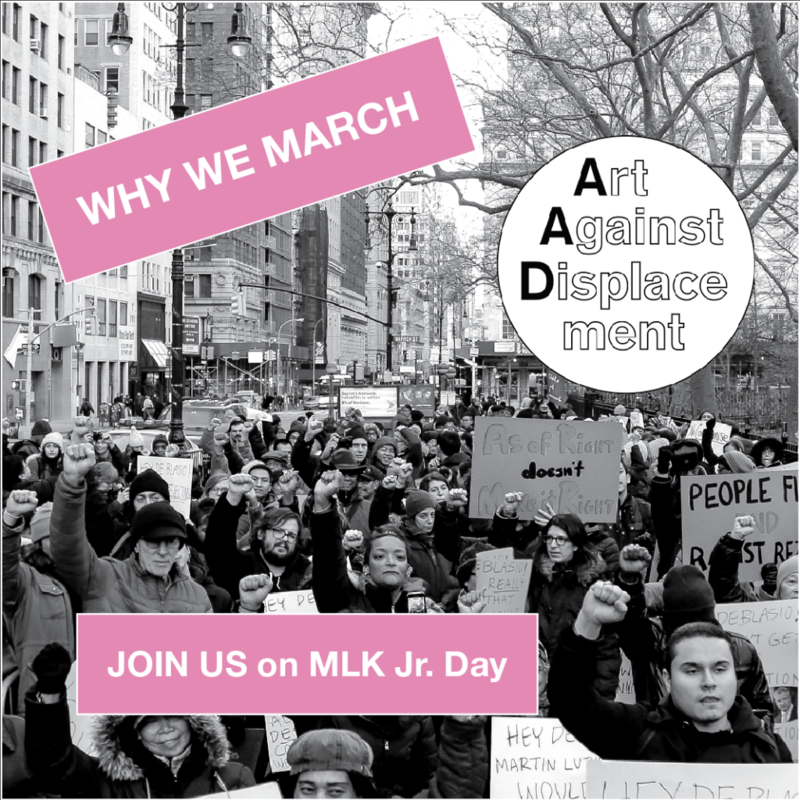 Metaphors for justice occur in culture before justice occurs.” On MLK Jr. day, the Coalition to Protect Chinatown and the LES will gather at the corner of Pike and Cherry, and march to City Hall. It was 2015 when the Coalition last stood on this corner, protesting what would become Extell’s One Manhattan Square, the first luxury mega-tower to be built on the LES waterfront. Then, and now, we protest the City administration’s continued refusal to extend the same protective zoning to Chinatown and the Lower East Side that was granted to the East Village in 2008. Mayor de Blasio rejected community-led Chinatown Working Group Rezoning Plan as too “ambitious” but had the plan been passed, an 80-story tall, $2,251 per square foot condo would not be towering over its NYCHA neighbors. On Monday we gather as a unified community, to protest the City Planning Commission’s vote to violate the City’s own zoning laws in their approval of four more luxury mega-towers on the Two Bridges Waterfront. We will march to City Hall as a powerful and diverse group of citizens who recognize a citywide struggle of neighbors under similar threats across the boroughs. We march to symbolically reclaim the streets together. For many, becoming involved in local politics is a daunting and confusing task. While self-education is the first step to becoming an active member of one’s neighborhood, the process of learning is accomplished most easily by listening to the lived experiences of our neighbors. At a recent Two Bridges Town Hall, a teacher at P.S. 2 shared that their school saw a 50% decline in enrollment and they suspect this was a result of the ongoing displacement of low-income families from Chinatown and the LES. The changing enrollment demographics threaten Title I funds, the largest source of federal aid for elementary and secondary schools, providing funding for after-school academic support, bilingual programs, health services, parent involvement efforts, and other programs for students from low-income families. It is exactly this feeling that has been expressed by LaGuardia Housing residents as they shared their anger and frustration over plans to build a 35-story tower, that includes 50% market rate units, on a parking lot next to the Little Flower Playground. The City administration has failed to protect NYCHA residents and Mayor de Blasio’s NextGen Neighborhoods program, which calls for NYCHA to sell off tracts of undeveloped land to private developers, is a slap in the face to those tenants who have endured enough hardships after decades of mismanagement and neglect. We cannot allow our communities to be re-defined in such a way that long-term residents are suddenly identified incorrectly as suspicious, threatening or not-belonging. Concerns around gentrification and displacement in Chinatown and the Lower East Side are not new. However, the increased visibility of art galleries in the area has expanded the conversation about how art and culture are instrumentalized by for-profit developers looking to raise property values and lure wealthier residents to the area. It is widely agreed that an influx of artists and art galleries is a visual indicator that a neighborhood is being gentrified. We do not presume that artists and creative workers are acting in bad faith when they choose to open shop in their chosen neighborhoods but rather operate under the incorrect premise that their presence is neutral. Every resident influences a community. The notion that we as individuals are able to divorce ourselves from our impact on the neighborhoods where we work and pay rent is a falsehood that creates divisions that the City administration uses to push forth developer-friendly plans without opposition. Rather than sheepishly avoiding the struggle at hand, artists and art workers can use their skills to become a more generative presence in our communities. Let’s work together so that our friends and neighbors no longer perpetuate unproductive narratives that claim that gentrification is too complex of an issue to grasp, or that communities are powerless to turn the tide and encourage folks to learn how to use their existing privileges and resources so that those who have been organizing in the neighborhood for decades do not have another obstacle of gentrification to overcome, but rather a new ally with new connections and resources that can be used to protect and support their community so that the hard work no longer solely rest on the shoulders of the most vulnerable. Neighborhood activists play a crucial role in making up for the failures of our elected officials. Art Against Displacement is a member of The Coalition to Protect Chinatown and Lower East Side and supports the Lower East Side Organized Neighbors (LESON) lawsuit against the City administration’s decision to approve the four proposed mega-towers on the Two Bridges waterfront, despite the fact that they violate the existing zoning regulations. This lawsuit, which is being litigated by the Asian American Legal Defense and Education Fund (AALDEF) will only be successful in stopping the proposed mega-towers if the community comes together to collectively pressure the City administration. These towers are illegal, plain and simple. So we ask our peers and neighbors to join us in sending a strong message to Mayor de Blasio – we will not sit back and let his failures destroy the vitality of our City. We do not underestimate the creativity, determination, and strength of the people who make up the fabric of NYC nor should our elected officials. We ask that you join us in honoring Rev. Martin Luther King Jr.’s vision for a more equitable and just society as we come together as a unified community and City. Chinatown and Lower East Side residents and businesses, new and old, will join the Citywide Alliance Against Displacement in front of City Hall to demand that the City administration stop the illegal waterfront towers, stop the subsidizing of private developers and the selling NYCHA land and to pass the FULL Chinatown Working Group Rezoning Plan. Let’s march to save the LES and reclaim our city.